Yoga may help combat depression, post-traumatic stress disorder (PTSD), and anxiety in seniors. Yoga continues to grow in popularity and for good reason, too. Yoga has been found to provide multiple benefits such as improving flexibility and strength along with reducing stress and anxiety. For the study, researchers analyzed 13 literature reviews accounting for 185 articles. The researchers found that yoga has the potential to offer benefits to those suffering from PTSD, anxiety, and depression. A study out of the University of Illinois recently found that practicing yoga consistently for eight weeks will improve your thinking and memory function. Researchers tested yoga participants against a group of people who just did stretching and toning exercises. Clearly, there’s something to this mind-body practice that is more than breaking a sweat and feeling at peace with the world. Some people might be a little reluctant to step into a room full of yogis who look more like ballet dancers with impeccable posture and long, flexible limbs. 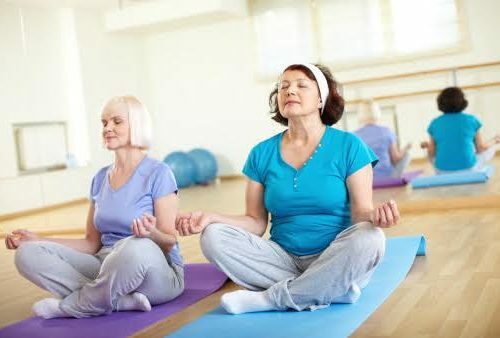 That can be intimidating, especially for older adults who haven’t tried yoga before or have trouble getting up from their chair after a long sit. No one wants to feel anxious and completely out of place. And it seems counterintuitive when you’re trying to find your inner happy place. Men, especially, don’t like to put themselves in situations where they feel uncomfortable and less than knowledgeable. They don’t ask for directions or like to see their doctor for this very reason. Sounds familiar? It turns out, though, that yoga might be just what seniors need, elderly men in shorts included. The practice can help older adults battle depression and anxiety. That’s a huge concern for this age group with a growing issue of mental decline, and reports of addiction and misuse of prescription medication on the rise. To complicate matters, many seniors assume that poor mental health is simply a part of aging and they just have to live with it. They don’t reach out for help or try to be proactive with diet or exercise. I’d like to make this a wakeup call to change all that, because you can change it. A review of studies on relaxation exercises, published in the journal Aging & Mental Health found that the ancient practice of yoga offered the most effective, lasting relief from depression and anxiety. Researchers say up to 40 percent of older adults report anxiety, and anywhere from 15 to 20 percent experience depression, making a case for relaxation techniques for the over-60 age group. They looked at 15 studies from the last 20 years to determine the best of these six techniques: yoga, listening to music, tensing and relaxing different groups of muscles, massage therapy, and stress management training. Yoga, music intervention, and the muscle tensing and relaxing exercise (called PMRT, for progressive muscle relaxation training) were considered best for depression, and the music and yoga interventions were the best for relieving anxiety. But it is yoga that has lasting effects, which is important when it comes to signs of mental health issues. You want an intervention that doesn’t just mask the symptoms, but gets to the root of the problem. With yoga, seniors experienced all the positive effects from the breathing, stretching, and meditation exercises. Study authors say yoga’s relief from depression and anxiety lasted six months longer for seniors. “It could help counterbalance the negative effects of aging, improve physical functioning, postpone disability, decrease morbidity and mortality, stimulate the mind, and increase hope, reducing the risk of anxiety and depression,” the authors wrote. While medication and counseling can certainly help, why not try a beginners’ yoga class? Or start with a DVD so you can try some basic poses at home, and then join a class. You may get more out of professional instruction in a class setting, because proper form and breathing is key to safety and getting the most out of the practice. Plus, you’ll meet other beginners and make some new connections, also shown to be great for mental health and overall well-being.